Apitherapy News: If modern medicine is unable to help you, try Bee Venom Therapy (BVT)…you have little to lose. If modern medicine is unable to help you, try Bee Venom Therapy (BVT)…you have little to lose. The use of honey bee products for healing and health (known as Apitherapy) has been in use since ancient times, however, the most attention grabbing apitherapy treatment today tends to be the use of bee stings to reduce disease symptoms. The use of BVT for rheumatic diseases has been recognized for at least 2500 years. (Broadman 1962) While the majority of therapeutically applied bee venom is through injection in the form of desensitization shots for people suffering from hyper-allergic reactions to honey bee venom (anaphylaxis), anyone with access to a hive can obtain venom from the self-contained, self-sterilizing, self-injecting bee venom applicators living within. 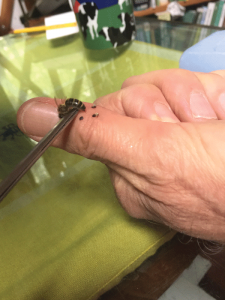 While bee venom injections are not yet approved by the medical establishment for use treating rheumatic diseases, the sting from the live bee is often used and found helpful for this purpose. Treatment typically consists of applications of bee stings three times a week, about every other day. Treatments are applied over the body on a rotating basis so that a former treatment area is not treated again until all symptoms of the previous stings have healed. This form of BVT is available almost anywhere and, as long as the patient is not hyper-allergic, the treatment is safe without long-term adverse effects even with long-term application of therapeutic doses.